Hello everyone! How do you like my blog’s new look? After my last post went live, I was looking at my site and realized I’d had the same theme for quite a few years and decided perhaps it was time for something different. So I previewed and played and this style spoke to me. I like the notebook header image (very appropriate), and the colors are great; anything green makes me happy. Even my BFF approved, and we all know how important that is. Once the new theme was in place, I felt a review of my novel pages was also in order. That task resulted in a makeover for them as well. I renamed a few pages, added Details and Reference sections (some of the word counts are astounding, especially considering the books aren’t finished yet!) and added Frankie’s someday novel to the main page. I’ll work on tweaking the other story pages too so stay tuned. As for Camp NaNoWriMo itself, I’ve got a few days until it’s time to hightail it to my cabin, say howdy to my bunk mates and start writing. I’ll start Saturday, April 1st with my morning ceramics class — totally an approved camp activity, right? — and then meet M for dinner and a writing work session. By then I’ll need to have finished the last little bits of prep work so I know where I left off in November and where I need to go from there. Thankfully I found my outline, but now the question is: how will I end the novel, should I be fortunate enough to get that far? After reading what I jotted down, there’s a part of me that isn’t sure it’s the best way to go. I know how I’m going to resolve that last big story arc (aka casting the counter-curse) and yes, it’s a given that my two MCs will get together in the end, but what that really means is now a big ol’ question mark. In last week’s post, I made an indirect reference to the Bullet Journal system. Some of you may know what that is, others of you may not. So, I thought I’d take this opportunity to share with you what it is, why I care, and how I think it’s going to help me this July with Camp NaNoWriMo and regular NaNoWriMo this coming November. This is going to take a little bit, so I apologize in advance for the length of this post. Even in this digital age, I still like to write things down on paper, especially lists. I love them, and here’s just a few I’m currently keeping handy: a general wish list; craft project to-do lists; must-see summer movie list; binge-watching TV lists, one each for on- and off-air shows; and Magic-cards-to-buy lists, just to name a few. I like the satisfaction of crossing things out when they’re done, and hitting “delete” in my Google app just doesn’t have that same oomph to me. So I’ve always had problems finding an agenda system that worked for me. Daily pages waste too much space, weekly pages don’t have enough space, and monthly pages are just ridiculous. I discovered it by way of my friend and YA author, MG Buehlren, when she was posting on Facebook about her BuJo templates for sale on Etsy. My brain perked up, and soon I was reading about a planner system where order matters only as much as you want it to, and you determine how much or how little space you use for your calendar/list/doodles or whatever. 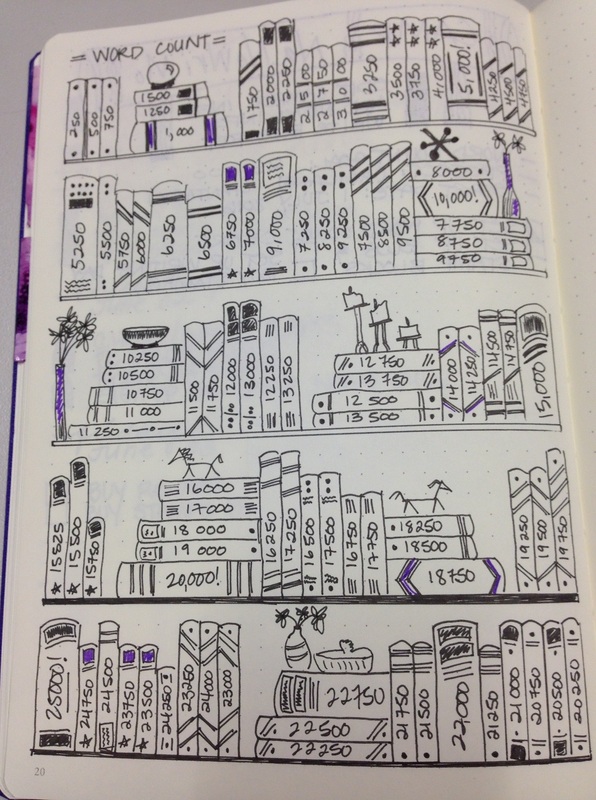 Ever curious, I joined MG’s Facebook group for Bullet Journal Junkies, started scouring Pinterest for more pictures and ideas, and followed Bullet Journal-related blogs and Instagram accounts. I was so eager I started with the last week in October 2015 because I couldn’t wait for the new month to get going. I began with an old composition book I had lying around, playing with the layout and using boxes to fill in completed tasks because that was immensely more satisfying than X-ing out a small little bullet icon. It didn’t take long before I was redoing everything into a new fancier Circa binder from my existing stash with new dotted grid pages, Circa being Levenger’s system of movable pages I’ve been using for years for my movie and book lists. 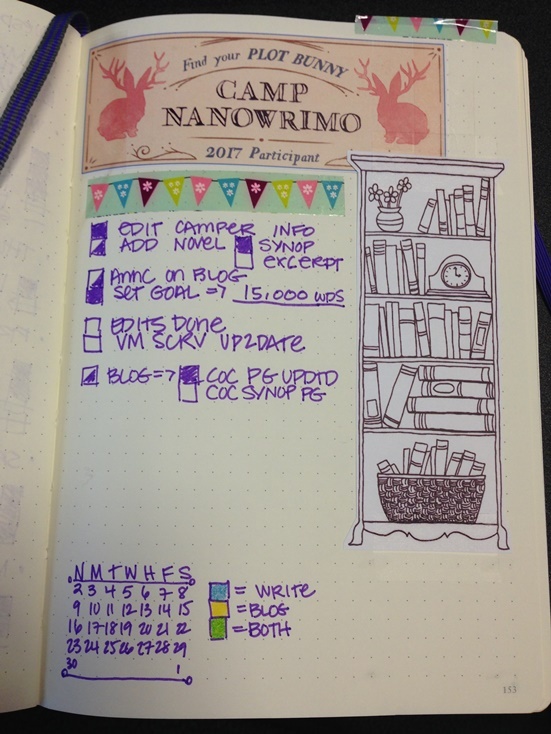 I even created a couple NaNoWriMo pages in November, but because it was still a new system for me, I wasn’t happy with the pages I’d created and I stalled out on NaNo after a couple of weeks. At the end of May 2016, it was time to start journal #2. Despite my good intentions to use a grid notebook I had on hand, I saw the gorgeous purple Leuchtturm 1917 dotted grid version in the photo at a local bookstore and just couldn’t not take it home. I also picked up a black soft cover dotted grid version as well. While I use the purple one for my daily journal, the black one holds my collections: lists of books to read, movies to see, Xbox games and LEGOs to buy. I also wanted to get a bit creative this time around, especially with my “Books to Read and Buy” pages. So I proceeded to create a layout that looked like bookshelves, with varying sizes and styles of volumes, spines and stacks. Then I decided that since I’d flaked and not joined Camp for April, I definitely needed to do Camp in July because I really wanted to see how Reese and Rowena’s story would end. So that brought up the question, “how do I track July’s goal of 25,000 words differently than back in November, so that it’ll be something I’ll keep up with, too?” Then it hit me. Remember that “Books to Read and Buy” page I mentioned a moment ago? Well, I wondered if I could modify that somehow into a word count tracker page. Turns out, I could, and I did, with what I think are fantastic results. Heck, I even shared snaps of the pages to the Bullet Journal Junkies Facebook group, and received lots of positive comments on it. One gal even requested the original large images I’d taken with my phone to print out on poster paper so she and her son could use them to track their summer reading. I mean, c’mon, how cool is that?! A section of my new Camp NaNoWriMo Word Count Tracker page. Click the image to see the full page design. The photo at left shows you a couple of the shelves I’ve created, especially that last book sporting my final goal. Clicking on the image will bring up the entire page of books (250 words per “title,” for 100 total) so you can see the variety of spines, flowers and other goodies I added to the page to make it fun and interesting. Now, with this page, instead of updating a boring blank line with a number, I get to fill in the spines of books, each representing words written. No matter how much or how little I write each day, I’ll be able to see the progress grow as I color in each spine as the goal is reached. I’ll still let Scrivener do the heavy lifting as far as targets go, but I’m looking forward to sitting down after writing with my colored pencil at the end of the day and coloring in as many books as I can up to that day’s total. If it works well, and I have a feeling it will, I’ll have a tried and true method to use come November. With double the word count to track, I admit I’m looking forward to drawing out my shelves and books in order to get to that last 50,000 volume. Hopefully, I’ll have a finished novel at the end, too!